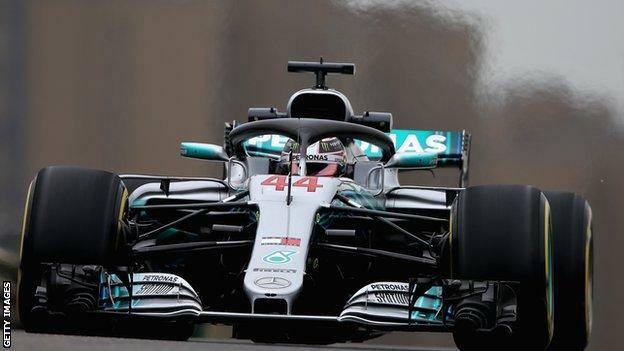 Second practice is live on 5 live sports extra and the BBC Sport websiteLewis Hamilton dominated first practice at the Chinese Grand Prix as he seeks to bounce back from losing the first two races of the season.Despite a spin in Turn 10, it was the best possible start to the weekend for Hamilton, who was in scintillating form on a track he has often excelled.The world champion ended the session 0.359 seconds quicker than Kimi Raikkonen, despite using harder tyres. Hamilton's team-mate Valtteri Bottas was third, 0.458secs off the Briton.Hamilton was the quickest man every time he hit the track, from his first flying lap, which was more than a second quicker than anyone else at the time.He was on course for an even faster lap midway through the session, after Bottas closed the gap to under half a second for the first time, but lost control negotiating the complex before the long main straight. The Shanghai Tower is the second tallest building in the world, standing at 2,073 feet / 632 metres, but well below the Burj Khalifa in Dubai which stands at 2,717 feet / 828 metresHaas were best of the rest, with Kevin Magnussen seventh and Romain Grosjean ninth split by Renault's Carlos Sainz, whose team-mate Nico Hulkenberg was 10th.And Toro Rosso were again ahead of McLaren, Pierre Gasly, so impressive on his way to fourth in Bahrain last weekend, 11th fastest, 0.007secs quicker than McLaren's Fernando Alonso.Their team-mates had a difficult session. Brendon Hartley in the second Toro Rosso was 0.678secs off Gasly and Stoffel Vandoorne had a spin and visit to the gravel on his way to 18th fastest, 0.712secs off Alonso.